Ive just sold my old Burgundyglo 1975 4001 to finance a new 4003. The 4001 went for £600 (not bad as I paid £350 for it nearly 20 years ago) and I am getting a new 2005 4003 for £900. Just gotta decide between FG or MID! Erring towards the blue as the newer style FG finish seems different to that on my 1999 FG 330. I was just wondering if there is any major sound differences between old and new, im just a casual player who worships the Rick brand you understand so nothing too technical. Why sell? Well basically I just fancied a "new" bass to go with my 330-6FG, 330-12JG, 360-6MB and 620-6MID that are all under 6 yrs old. Comments, and reprimands, welcome board! I'm no expert on these basses, but I have played both, and in my opinion the main difference between them is that the 4003 neck is slimmer, making it easier to play, and the sound is a bit clearer as well. I'm sure there are other people on here with a different opinion than mine, and with a better knowledge of the real differences, but this is how I feel they compare. The major difference without being technical, is that the pickups of the 4003 are hotter in the 4003 than the 4001, resulting in more output. The main difference between the two basses is the 4003 has a more modern truss rod design, and can handle higher tension strings. This caused a problem with some old 4001's, where using high tension strings caused neck problems. The 4001 came with flatwounds, and the 4003 was made for roundwounds. The necks on the 4003's were thicker than the 4001 also, as well as some changes to the shape of the body. I haven't played any 4003's lately, so I can't comment on the neck thickness, but the body shape is back to the old 4001 shape. As far as pickups, older 4001's had the lower output pickups, which were cleaner, if not a bit thinner sounding. Then they went to the high gain pickups, which over the years have become hotter still. BTW, you should have gotten more money for that 4001! The old ones are worth quite a bit these days. I have a 73 4001 and a 89 4003. I don't notice any difference in the neck or the body as far as playing, but the 4003 has a brighter sound compared to the 4001. I use roundwounds on the 4001 without trouble. The 4003 has hotter pickups too. I never had any trouble with roundwounds on either of my '73 4001's, but many have, which led RIC to develop the new truss rod system. the neck on my (80)4001 is thinner than the neck on my (06)4003, the neck om my 4003 is the same as my p-bass. 4003 necks are thicker, and the pickups are hotter with a higher output, but it has always seemed to me that the 4003's sound a lot deeper and beefier than the 4001's. I'm thinking of selling my 4001 and going the 4003 route. Rickman says the neck is slimmer on the 4003, other say it's thicker. How about some more input? I suppose the logical thing to do is buy the 4003 and compare them myself. Most 4003 necks are thicker than the 4001 necks. 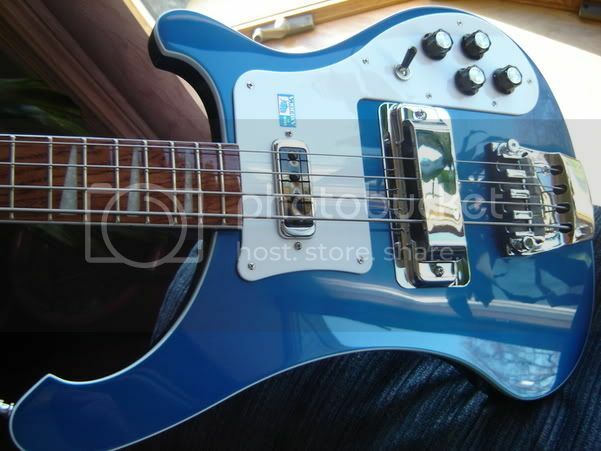 But recently Rickenbacker told us that the 4003 will get a new slimmer neck profile.